There is so much more to Universal Orlando than just theme parks and one of those areas is Universal CityWalk. CityWalk has it all from award winning restaurants to exciting nightclubs and entertainment to the best of shopping and a movie theatre with 20 screens. And best of all is that CityWalk is located just outside of both of the Universal Orlando theme parks so you are still close to the action. The restaurants at city walk are in a word, impressive. The collection is as good as anywhere you could probably go on vacation. On top of that CityWalk has all types of dining from around the world in both a casual and a table service setting. World renowned chef Emeril has two restaurants in this entertainment district for you to enjoy. If seafood is on your taste buds you should visit the Bubba Gump Shrimp Co. Restaurant and Market or if it is a frozen beverage you seek stop by Jimmy Buffett’s Margaritaville for a great time and great food. The restaurants are just the beginning with CityWalk also featuring some great night clubs and entertainment venues. The world famous Blue Man Group is the hot ticket item in all of Orlando so make sure to talk to Jon at Big Dreams Travel if you would like that included in your trip. If music and dancing is what you like then you can stop at the Red Coconut Club or Pat O’Brien’s for a great time. There is also a live karaoke stage at CityWalk on most days. 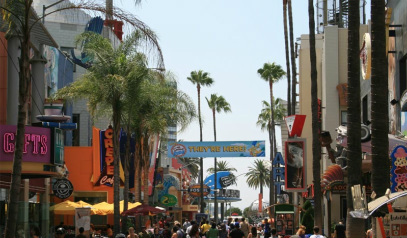 Finally, if shopping and movies are your thing then CityWalk has those as well. From down home boutiques to well known stores like Fossil or Element the shopping at CityWalk is excellent. And if you just want to relax for a little while on your vacation CityWalk offers a 20 screen AMC movie theatre that is going to be showing all of the latest releases.